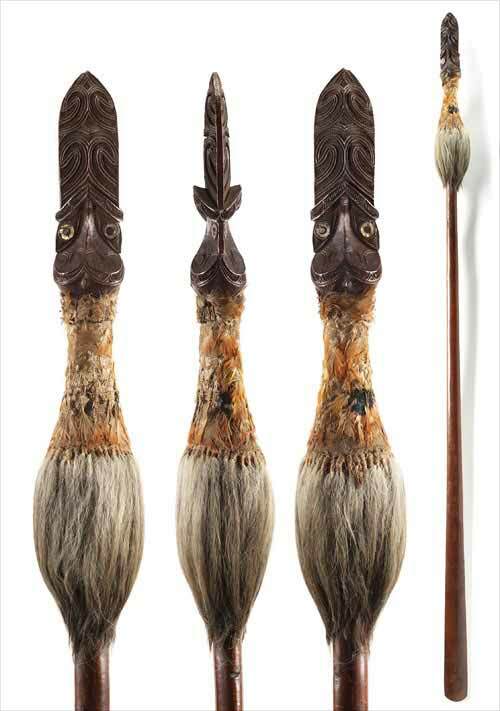 This impressive taiaha dates from about 1800. Its origins are unknown, but it is a fine example of this long two-handed weapon. The pointed end is carved in the shape of a head and is therefore termed the upoko. The protruding arero (tongue) provides the jabbing implement. Below the upoko is a tauri (collar) made of bird feathers and dog hair. The opposite end of the taiaha has a flat, smooth blade called a rau.